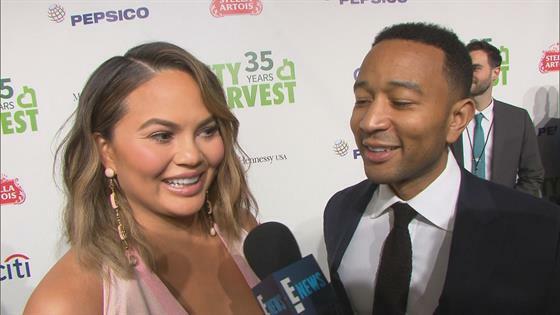 Chrissy Teigen and John Legend couldn't help but show each other some major love on the red carpet last night while the duo attended the City Harvest's 35th Anniversary Gala at Cipriani 42nd Street in New York City. While at the glittering gala, Chrissy and John chatted with E! News about gearing up for the arrival of their second child, a son who is due in June, and how this pregnancy is different from when she was expecting daughter Luna Stephens, who celebrated her second birthday earlier this month. When asked about how this time around was, Chrissy admitted to E! News, "You realize your second pregnancy is harder because you have a kid already." The adoring music man chimed in, "You have to divide your energy between raising a kid and and carrying one as well." The 32-year-old personality, who dazzled in a Valentino two-toned hammered silk dress, Lorraine Schwartz earrings and diamond Ofira rings, did add that her hubby "helps as well." In November 2017, the duo, who tied the knot in 2013, announced they were expecting their second child with a sweet Instagam post featuring their daughter, pointing at her mom's belly and saying "baby! baby!" In early October 2017, Teigen talked about her hope to have a second child via frozen embryo transfer during an interview with InStyle. Teigen also shared with the magazine that she and Legend started with 20 embryos. After being genetically tested, three of those embryos were deemed normal. "The first little girl didn't work, and then the second is Luna," Teigen said. And the third is their soon-to-arrive baby boy! As for last night's event, Teigen and John were at the gala to help support City Harvest, a non profit organization that rescues food to provide it to 500 community food programs throughout New York City. Just last night, the duo helped $2.2 million for the organization through the auction after two bidders each paid $1.1 million private dinner cooked by celeb chef Eric Ripert with a performance by Legend and hosted by Teigen, Richard Gere, Jean Reno and Sandra Ripert.